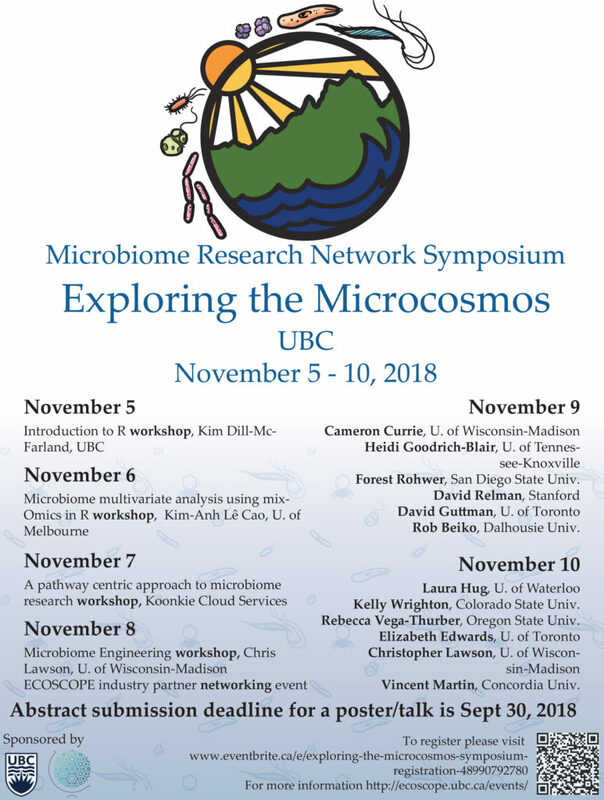 Note: this workshop is primarily restricted to Microbiome Research Network students at UBC until Oct 22 when the registration will be open outside MRN if space is available. The objective of this workshop is to introduce fundamental concepts of multivariate dimension reduction methodologies for biological data analysis. Each methodology presented during the course will be applied to case studies available in the R package mixOmics. Methods for multivariate data analysis, data visualisation and microbial signature identification will be covered, as well as an introduction for multi-omics data integration. Understand fundamental principles of multivariate projection-based dimension reduction techniques. Apply those methods to high throughput biological studies, including your own studies. This a special workshop offering as part of the Microbiome Research Network’s Exploring the Microcosmos Symposium. Tickets are available to MRN members only until Oct 22. At this time, additional tickets will be made publicly available if space is available. “Introduction to R”, EDUCE modules in MICB 301/405/425, or equivalent knowledge of R.
Microbiome Research Network (MRN) students should contact info.ecoscope@ubc.ca with 1) their name, 2) their PI’s name, and 3) the name of workshop to receive a registration code. Dr Kim-Anh Lê Cao (University of Melbourne, Australia) was awarded her PhD in 2008 at Université de Toulouse, France. She then moved to Australia as a postdoctoral fellow at the University of Queensland, Brisbane. Since the beginning of her PhD Kim-Anh has initiated a wide range of valuable collaborative and research opportunities in both statistics and molecular biology. Her main research focus is on variable selection for biological data (`omics’ data) coming from different functional levels by the means of multivariate dimension reduction approaches. Since 2009, her team has been working on developing a statistical software dedicated to the integrative analysis of ‘omics’ data, to help researchers make sense of biological big data. Kim-Anh is a senior lecturer at the University of Melbourne (Melbourne Integrative Genomics, School of Mathematics and Statistics), and regularly runs statistical training workshops and short series seminars as well as mixOmics multi-day workshops.